Please visit our website for more dates and events. The Kennedy Handbook is designed to provide students and the parents of Kennedy Baptist College, with useful information. 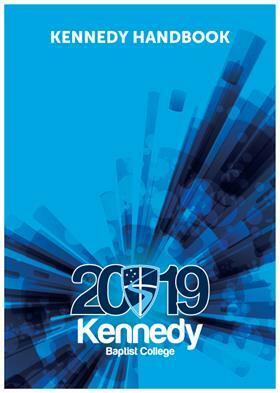 Kennedy Handbook is now available online. * Closed for lunch 12.30 to 1pm. Closed on Friday. Uniform Price List Information for 2019 Academic Year is now available online. Parents are asked to notify the College before 9.00am on the morning of absence by emailing us at absent@kennedy.wa.edu.au or by phoning the absentee line: 08 6188 0698 or by filling in the online absentee form on the Kenendy website here. 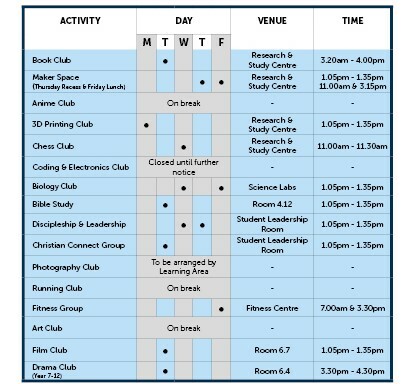 Please click here for Tutoring Timetable. Kennedy continues to support and promote this project as we still have 25 impoverished students available for sponsorship. Should you wish to sponsor a child or support our Centre in Phnom Penh please do not hesitate to contact our Administration. Please click here for more information. Either email the Registrar with any changes to address, phone numbers and email address, stating your child’s name and surname or update details via Concent2go. Withdrawing your child from Kennedy? If there is a potential change in circumstance that may impact your child’s enrolment at the College please keep the Registrar informed via email. Kennedy operates a bus service (independent to Transperth) providing an option for families in the suburbs of East Fremantle, Bicton, Attadale, Melville and Willagee. Private use of this service is by arrangement with Kennedy Administration. We are always looking to improve our College and take care of our community. Will you tell us how we are doing and review us on Google? Submit your review here. The next newsletter will be published on Thursday 2 May 2019. Photo above: Easter Services at Kennedy. 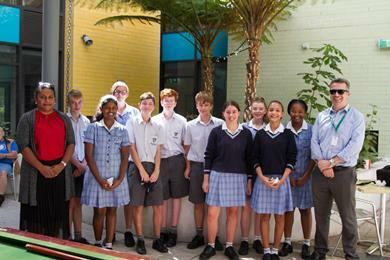 It was fantastic to see our Year 7 students settle into secondary school life with the help of their Year 11 mentors. Our student councillors have been doing a wonderful job developing and growing as leaders in the College. 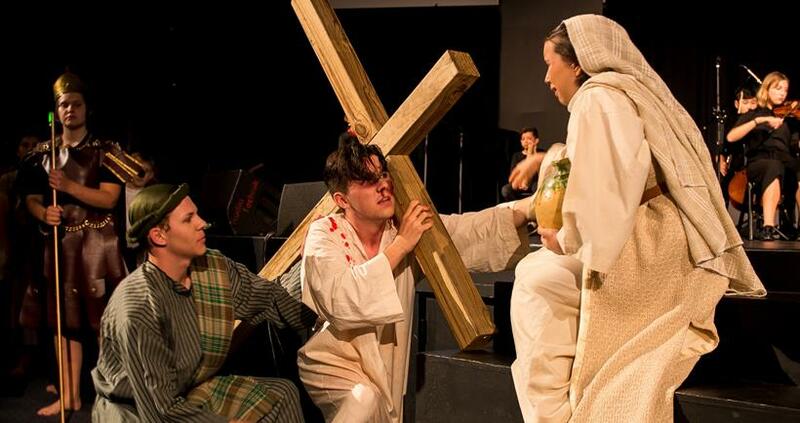 Our Easter Services were outstanding evenings with excellent performances from our Arts students. Please click here for photos. Our Interschool Swimming team performed incredibly well in C division against very tough competition. 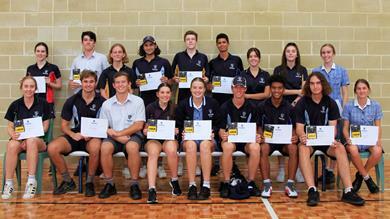 Our senior school students have produced outstanding results in the SAS interschool sports competition. This included premiership wins for the Senior Boys A and B Basketball, Girls A and B Basketball teams, Girls Softball, Boys Touch Rugby, mixed Frisbee A, Boy Tennis, Boys Beach Volleyball A, Girls Indoor Beach Volleyball A and B, Boy Cricket. Congratulations to all staff and students involved with our interschool teams. It has been a pleasure to spend time with our students on camp this week. Our goal has been to challenge students in a different context and it has great to see our students respond to those challenges in a team environment. This week the National CEO of Australian Curriculum Assessment and Reporting Authority (ACARA) contacted me to advise that ACARA has identified Kennedy as having demonstrated substantially above average gain in reading and/or numeracy achievement, as measured by NAPLAN. It was acknowledged that improvement in student literacy and/or numeracy of this magnitude, as measured by NAPLAN, is significant and worthy of highlighting. This is a wonderful achievement for our College and is the result of hard work by staff across all Learning Areas focusing on improving the literacy and numeracy standards of our students. This is an outcome that members of our community should be proud of. Thank you to everyone for your ongoing support this term. We wish everyone a safe and relaxing term break. I grew up in a Christian home. Easter was very much about attending church on Good Friday and Resurrection Sunday; hymns were sung, and sermons preached. Admittedly, that was not where my focus was. Yes, I looked forward to Sunday, but not because it was when we would celebrate the resurrection of Jesus – it was because we got to eat chocolate eggs. Hot Cross buns were not that interesting, mainly because I have never enjoyed the texture of cooked raisins, but the eggs (if they were of the chocolate variety) were winners. We have done our best to sanitize the story of Easter and, yes, I still enjoy Easter eggs, and now that there is a variety of non-raisin Hot Cross buns, I eat them as well. But central to the story of Easter is the Cross with the message that human history, secular and non-secular, pivots around this single event. Please see the bottom of the newsletter for churches hosting Easter services in our city. We encourage you to attend. As we draw closer to the conclusion of our students' first term at secondary school it has been wonderful to see how they have grown in confidence and made new friendships. This was strengthened over this last week as we made our way to Fairbridge Village for our Year 7 Foundation Camp. Our students and staff were challenged with an array of exciting activities from scaling heights to canoeing. Throughout each activity the students encouraged each other to do their best and go out of their comfort zones. It was an honour to watch them blossom and create lasting memories. I would also like to make special mention of our Year 7 girls Bridget Cook, Lisa Burdinat, Beth Coxon, Julie Oh and Maya Howard whose commitment and organisation was outstanding to raise money for the World's Greatest Shave. We look forward to hearing about your experience over the holidays in Term 2. Wishing all our families a safe and blessed Easter. The Year 8s have had a great start to the year and have matured and settled down very well. We had a number of new students join us at the beginning of the year and it has been encouraging to see how well they have settled into the year group. We have had a busy few weeks with a second Community Service activity at the St Ives Centre as well as very interesting Extended Form activities including a Protective Behaviours session as well as a film and popcorn time. Last week we enjoyed a very well run Tabloid Sports time on the oval. Thank you to our two Year 8 Phys Ed Form teachers for all the time and effort that went into planning the event. The College Easter Services were very well attended and it was great to see some of our Year 8s in the various items on the two nights. Money has been raised for our Kennedy Centre in Cambodia and many Year 8s also donated to the worthy Canteen Fund for cancer treatment for teenagers. Our Bounce activity on Friday night was a lot of fun and gave the 55 students who attended a great opportunity to socialise outside of school. We hope to run another social activity later in the year. These holidays during Easter we will be celebrating the death and resurrection of Christ, which gives us as Christians a wonderful hope for the future. I pray that it will be a blessing to you all and that we all have a safe holiday time. I look forward to working with you all again next term. 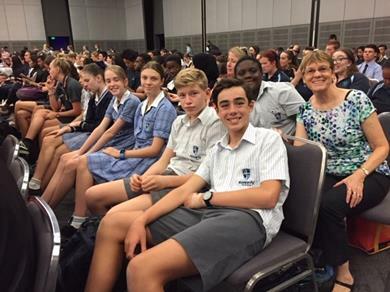 On Tuesday 26 March, the Year 8 Student Leaders attended the GRIP Student Leadership Conference. We had a blast learning that leadership is about people, not position or power, as well as what leaders should focus on. We learnt how the core of any leader is their character, as well as other important key concepts. Michael, the Year 8 House Captain of Stirling, got the chance to challenge another College student to a dance off. Of course, Michael won and is now the renowned Dance King. Overall this event was a great experience, with many chances to play games and have fun. The knowledge gained will certainly help our College grow positively. 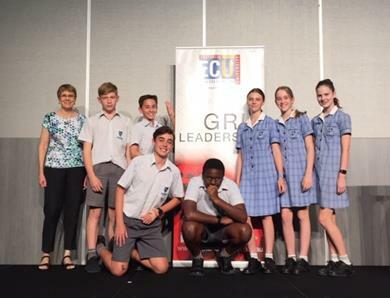 Photos above: Year 8 Student Leaders attended the GRIP Student Leadership Conference. As we head towards the end of a frantic and frenetic term and with the Year 9 students on camp, being with their friends and experiencing activities that put them well outside their comfort zones, it is a good time to reflect on the term that was. We have been privileged enough to spend two Community Service events with St Bartholomew’s House this term, engaging with the residents there and providing lunch for them. The residents at St Barts are in aged care and many have experienced a great deal of life so this is a fantastic opportunity for Kennedy students to participate with people they normally wouldn’t get the opportunity to meet. Our focus for the term has been for Year 9 students to engage in a growth mindset. With Year 9 being a make-or-break year, it is vital the students develop themselves in all aspects but particularly in their learning. Ensuring students grow themselves and continually make small gains daily allows them to realise they are not stuck in one level or grade and are able to make of themselves what they will. Of course, this does not come easily, and it is key that students work hard to make these improvements; nothing replaces hard work and the will to achieve. The Year 9 Adventure Camp has many opportunities and activities for students, these range from the extreme such as the giant flying fox, target shooting and ski biscuiting, to the tamer 20m abseil tower, kayaking and raft building. The activities are designed to both challenge and exhilarate the students; we want the Year 9 students to step out of their comfort zones, leave their Instagram-addled world behind, and focus on understanding that any limits placed on them are ones they put on themselves. We want our future leaders to believe in their own capabilities and realise their potential – if only to see that they are capable of so much more than they think. We hope the camp provided an excellent opportunity for friendships to be cemented, opportunities for new friends to be explored and experiences to be had. We wish you all a fun-filled and restful Easter break, one that allows you to recharge and reconnect with family and friends and we look forward to seeing you all in Term 2. Photos above: Community service events with St Bartholomew’s House. As the term comes to a close, we should be using it as a time to reflect on the achievements of a successful first term and then look forward with excitement for the rest of the year and beyond. During the term we have moved forward to consolidate prerquisites for Year 11 and explore career path ways. In Term 2 we will build on study skills and a work ethic that will enable students to work smarter and achieve better results in the future. At the moment all our Year 10 students are coming to the end of their Work Experience. I hope that this opportunity enriched their lives and gave them a clearer idea of what they want to do after College. Thank you for a very good term, God Bless and have a safe, enjoyable holiday. 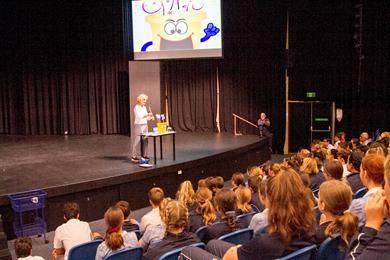 Photos above: Year 10s explore career pathways. It has been another whirlwind but exciting term at Kennedy especially for the Year 11 students who have made the transition to senior school. It has been great to see the students tackle their Courses of Study. It was a challenge with the new expected workload but it is a pleasure to see them take their studies seriously. During Term 1 students have been looking at setting goals and they had the opportunity to look ahead at their future and set some future goals that they can strive and aim for. The most exciting part of Term 1 is the Year 11 Transition Camp. 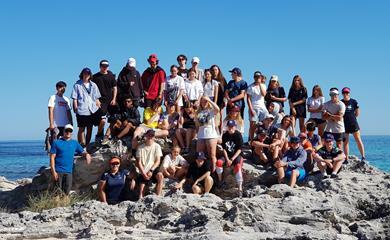 Yesterday all the Year 11s headed to Rottnest Island for and exciting few days. The camp has been designed to be a time of goal setting and self-motivation, along with some social discussion to provide opportunities to reflect on Term 1. The weather forecast still looks great and I am really looking forward to see students strengthen their relationships with each other and teachers over this time. Please continue to pray for the camp, for our safety and that students will get a great sense of belonging and come back feeling strengthened, inspired and ready for Term 2. I wish you a safe and enjoyable holiday break. 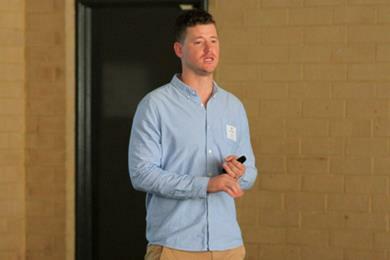 Photos above: Event speaker Mr Josh Bond spoke to the Year 11s during Extended Form. As Year 12 students gets into full swing I would like to remind our students and their families of the importance of balance. Students are encouraged to maintain consistent revision whilst ensuring they have a nutritious diet and adequate sleep. To facilitate this we had Dr Jenn Walsh, Research Fellow in the Department of Pulmonary Physiology and Sleep Medicine at Sir Charles Gairdner Hospital and Lecturer at the Centre for Sleep Science at the University of Western Australia, come and speak to our Year 12s on the importance of sleep and to give some advice on how to optimise their sleep. Please click here for some tips on optimising sleep. Another great resource is http://www.studentbox.com.au. Students can register at an online community of Year 10-12 students which contains study tips, past WACE papers and health advice. Otherwise we have a wonderful support network with our Pastoral Care team who are readily accessible. Term 1 has also been a time where our teacher mentoring program has been in full swing. For many Year 12 students this is the time to get serious about their studies and future careers, however, this can often be a period of pressure and confusion. Therefore, our College has a support network of teachers who can offer our students guidance and support to help them achieve their best results. The program runs over the course of the year with a small group of students and their selected mentor meeting regularly to act as a sounding board as well as provide structure for time management skills and ongoing encouragement to stay motivated. It is wonderful to see the difference this program makes in the lives of students as they know there is always another point of contact and how important their final year is to our school community. May the upcoming break be a great time to consolidate our first term’s learning, may it be a time for our Year 12s to relax, enjoy special family time and re-energise for Term 2. Photos above: Dr Jenn Walsh from the Department of Pulmonary Physiology and Sleep Medicine. This will be a fun filled morning so please come and join other Kennedy mums over a cuppa and some tempting treats at our annual Mother's Day morning tea. Grandmothers are also welcome! For catering purposes, we would appreciate your RSVP to Mrs Janet Hair by clicking here before Friday 3 May 2019. Remember when school libraries were places only for quiet work and reading during your break times? Well, thankfully, those days are long gone! There is a constant buzz of excitement at recess and lunch times as students participate in a range of opportunities that the Research and Study Centre provide. This is no more obvious than in Maker Space, which continues to be a creative whirl of activity! On Mondays, you can see the 3D Printing Club in action - producing projects like name tags, phone stands and own choice designs. Thursday is craft day where the Maker Space table is often in a colourful chaos of wool, paper or paint with students busily constructing creations. These have included: kirigami swirl boxes, marbled mugs, Easter egg sun catchers and Bunny pencil toppers. Finally, Fridays are a lucky dip – with Easter egg painting, electronics and ‘all things paper’. Students seem to enjoy the creativity, collaboration and conversation – plus the occasional ‘energy crystal’ (chocolate treat), which is rarely refused! Photo above: Easter Egg Sun Catchers. 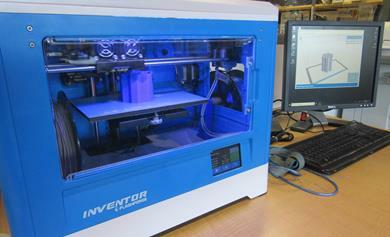 Photo above: 3D Printing Club in action. Please click here for a larger version of the timetable. Kennedy provides students with the opportunity to participate in a wide variety of extracurricular activities. Participating in extracurricular activities builds students’ confidence, self-esteem, teamwork skills, friendships and competitive spirit - essential skills for students as they progress into adulthood, further study and the workforce. The purpose of extracurricular activities is for students to develop and pursue their passions and goals while creating community and allowing opportunity for friendship outside of the classroom. As the culmination of their snorkelling lessons in the first half of Term 1, Year 11 Outdoor Education students attended a snorkelling camp on Rottnest Island in Week 6. For many students from the three classes it was their first opportunity to fit everything they needed into a single pack, cook on a Trangia stove and sleep in a tent. Students rode between six beach locations over the camp and saw a wide variety of marine life. More than 400 species of fish have been recorded in the waters around Rottnest Island, making it an ideal location for students to practice their snorkelling skills. We had fantastic weather conditions for working on technique, and were able to observe interesting sea life as well as try some stunning swim-throughs on the reef. A surprise celebrity sighting was also a highlight for some students. On the final day of camp, students also had the opportunity to demonstrate some navigation skills by participating in an Amazing Race event. Everyone returned on Friday afternoon ready for some rest, however, the mix of snorkelling and the time spent with friends made the camp a memorable and very positive start to the year for Outdoor Education. 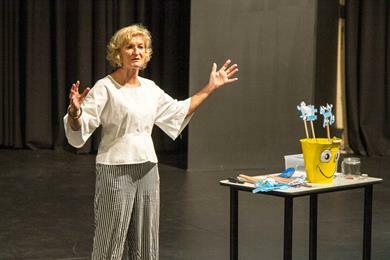 WA Performing Arts Perspectives is a showcase of the best of the best Performing Arts Graduates in Western Australia from the previous academic year. 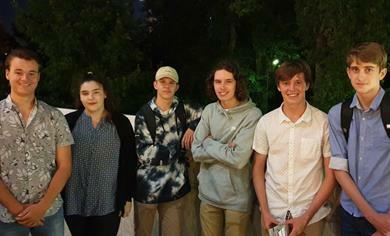 On 27 March, Year 11 and 12 ATAR Music, Drama and Dance students were privileged to attend the 23rd Annual Perspectives event at the Perth Concert Hall. The evening’s program was packed with extraordinary music, dance and drama items. Kennedy Baptist College students appreciated diverse works from which they could draw valuable tips as they work towards their Semester 1 practical exams. This was a one night only event and students and teachers agreed that it is never to be missed. Throughout Term 1 Kennedy participated in a variety of SAS sports. We are proud to congratulate the below students for achieving most valuable player in their chosen sport. Please be advised that the Administration Office will be closed for the term break on Monday 15 April 2019 and will re-open on Tuesday 23 April 2019. The Office will also be closed on Anzac Day Thursday 25 April. Students commence Term 2 on Tuesday 30 April at 8.15am. Students are to wear full winter uniform for Terms 2 and 3. Please note that Monday 29 April is a Staff Professional Development Day (Students do not attend). It is advisable to have your child try on their uniforms during the break so purchases can be made at the Uniform Shop if necessary. Winter uniform orders are available for pickup from the Uniform Shop. If you have not placed an order, we encourage that you bring your child in for a fitting as soon as possible. We hope that you have a restful and safe break during this school holiday period. Kennedy Baptist College can only administer paracetamol to students with parental consent. If your child has a condition requiring medication and you wish them to take the medication at College, please complete a medication form which is available from the office. Student Support Services will then store your child’s medication under lock and key. Please make sure all medication is in the original packaging as we cannot accept medication provided in zip lock bags etc. Thank you for your assistance in this matter. The Uniform Shop will be open during the 2nd week of the school holidays. Holiday hours will be Tuesday 23 April, Wednesday 24 April and Friday 26 April from 8.30am to 3.30pm. * Closed for lunch 12.30 to 1.00pm. Closed on Friday. To view the College Uniform Policy click here. 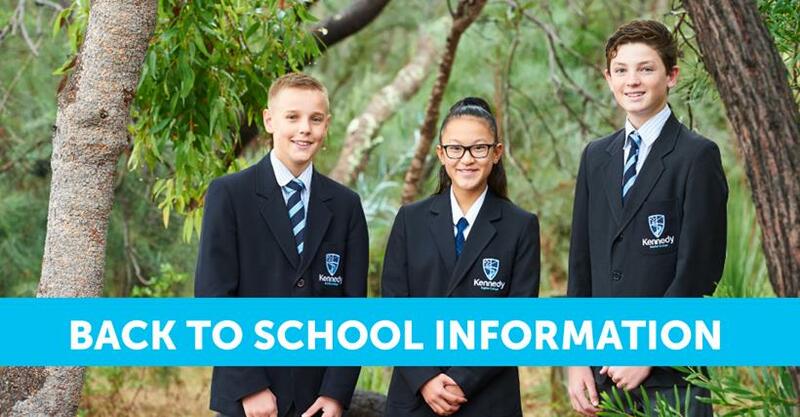 Please contact Mrs Kerry James via email for any other information of visit the Uniform shop to ensure that your child is ready to start Term 2 in full Winter Uniform. Online Canteen system provides an easy and convenient way of ordering your child's meals. 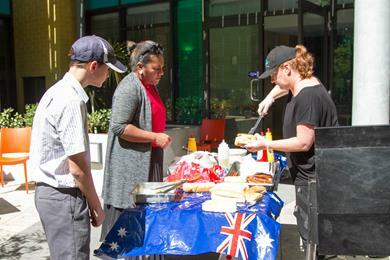 Eftpos facilities are also available for staff and students to purchase items at Beedawong Cafeteria. The Cafeteria is open for breakfast at 6.30am, recess at 11.00am and lunch at 1.05pm. All online orders must be made before 9.00am. For more information and to see the Term 2 canteen menu, please click here. The Kennedy Prayer Group - Wednesdays at 1.45pm. Book Covering - Once a fortnight on Tuesday mornings. ​​Please click here to sign up and volunteer.